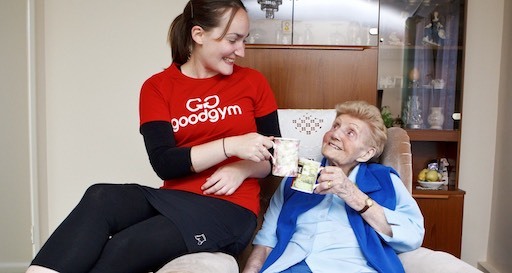 Mary was referred to GoodGym from British Red Cross in November 2016 after they had provided some support for her to leave her house and navigate a number of steps from her fourth floor flat, as she’d lost confidence following a bad fall. It’s been fun - really good. It means I definitely get at least one run each week whatever the weather. It’s been fun just hanging out with someone I wouldn’t have otherwise met. We’ve had loads to talk about. It’s actually pretty fun sitting down with someone you don’t know that much about and trying to work out what you’ve got in common. We actually have lots in common. Wednesdays have really changed for me - it’s something I look forward to, something I enjoy very much. It keeps me in touch with the rest of the world. I got my certificate from GoodGym saying i’d encouraged my runner, Matt, with his running. I’ve got it on my mantelpiece and i’m showing it off to everyone who visits. I came to England in 1940 and hadn’t seen the farm for many years - it was wonderful! Matt recently experienced what it was like to be a farmer for a day, and wrote about it for a book he’s currently writing based on trying out lots of different jobs in search of finding his dream job. He read it aloud to Mary - she thought it was very funny. She’s been sharing her stories about farm life including catching salmon - she used to go down to the river at the bottom of the farmyard and catch the fish by hand by tickling them until they fell asleep. Mary moved to Camden with her husband in the 1960s and has been in the same flat ever since. Matt commented that she’s lived there for over twice his lifetime! For Mary’s recent birthday, a friend bought her an original newspaper from the day she was born. Matt and Mary have been going through some of the articles and highlighted that front page news back in the 20s was dedicated to marriages and funerals. They plan to spend Matt’s visits in the summer reading the rest of the very hefty paper out on the balcony. We asked Mary what’s the secret to living so long - she said walking, hopefully running does the same thing too!